What broadband speeds could the UK copper loop manage? In an ideal world replacement of the copper local loop would happen in the next couple of years, but even the recent £1.5bn programme from BT suggests that the copper local loop is to largely remain. 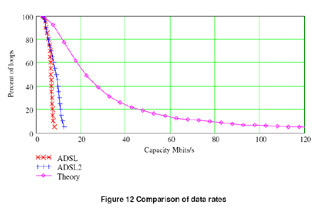 Ofcom has published a paper titled 'Assessment of the theoretical limits of copper in the last mile' which gives some idea of what is in theory possible over the existing infrastructure. 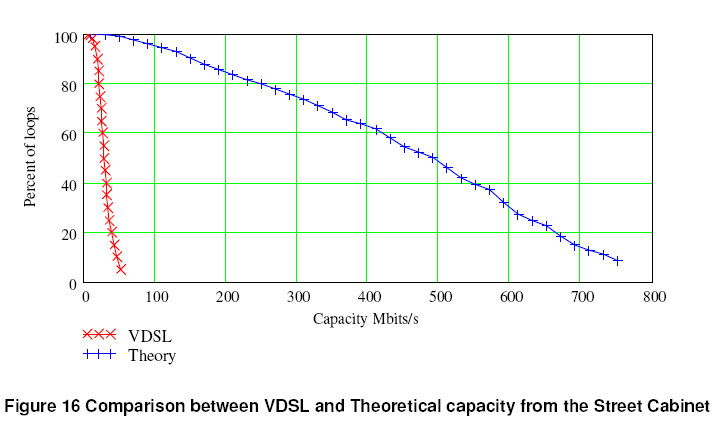 While the limits are theoretical, the paper does provide useful information on why a cabinet led deployment of VDSL and faster variants of DSL such as VDSL2 would improve speeds for more people than sticking to the current exchange led upgrades. The assessment is UK based, and takes into consideration areas like crosstalk, power levels to arrive at reasonably sensible figures that we may see broadband speeds approaching in the future. 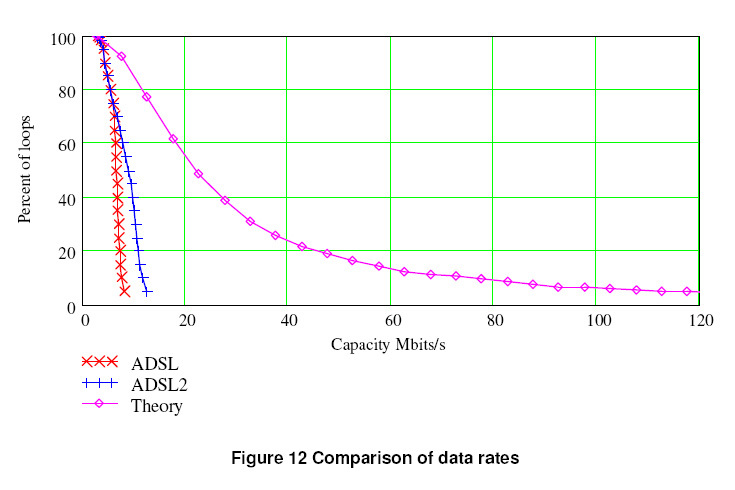 The above chart shows what is hopefully common knowledge, that ADSL and ADSL2+ only supply their best speeds to a small proportion of telephone lines. If UK copper loop based broadband stays stuck in the exchange, then improvements in technology will only benefit a limited number of lines. 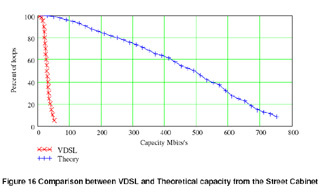 By moving the DSL hardware into the street cabinet, then the results are very different, in theory around 80% of lines then have a theoretical maximum of some 250Mbps. The graph also shows the speeds VDSL is expected to achieve, hopefully VDSL2 will supercede VDSL before it is rolled out, which for shorter lines (0.5km) may reach speeds of 100Mbps. The basic distribution of line lengths across the over 20 million telephone lines is the UK suggests that 18% of telephone lines are under 2km long, 43% under 3km, an unlucky 6% have a line longer than 5.5km. The situation if you look at the length of the telephone from the property to the street cabinet (known as the D side) is very different, only around 12% of lines are longer than 1km, with something like just 0.1% or 0.2% longer than 3km. So has the copper local loop reached the end of its lifespan? Not quite, but it is getting close, Fibre to the cabinet architectures will benefit broadband speeds greatly. This data will help communications providers to judge whether the life span of cabinet based broadband is worth the investment, or should a full fibre to the home architecture be used? In some areas such as Bournemouth and Dundee within a year or two the copper local loop may start to see a decrease in usage as people switch to fibre based connections. For blocks of flats, the Metro-Ethernet deployments employed by Ask4 could start to prove popular. Metro-Ethernet involves running a fibre to the basement of a block of flats, and using Ethernet to distribute it around the building. Then of course there is cable broadband which has the ability to run at 200Mbps or maybe even 400Mbps using DOCSIS 3.0 in the future. The one technology that is playing catch-up is the various mobile broadband technologies which are now starting to look at 14.4Mbps connections, but just like ADSL these suffer from signal strength issues, and while 3G coverage may claim to be 90% there is no indication of the actual connection speeds enjoyed in these areas. finally ofcom spouted out something useful but what many of us have known for ages, roll on the investment and rollout please BT. well we may have known it for ages, but big companies need official reports on this stuff... all they could say a few years ao, including some people here, is that it was not possible... And I say again, technology is no barrier!!! I think you'll find that Virgin- Telewest, NTL, knew this from the very beginning. in speed being achieved on BT’s copper network;"
Mobile BB? No chance. Freeview and Virgin aren't available. Aerial TV is lousy. I have to pay for Sky,and a TV Licence. No reduction for poor reception. In a Rural area, no-one will do anything to improve the Service. It needs miles of cable laid, or relay masts. Expensive and not cost-effective. TV licence pays for BBC TV and radio etc. It probably cost less than a BT managers salary!! - At least the good thing is, it shows those guys the HUGE difference between theory and reality! Yes, 'assume' is the main word for a lot of posters here(eg the quality of the SAME ISP can vary wildly depending on where in UK it is!! ), as well as most reporting - this is why 'official reports, and regular use of 'samknows' etc is absolutely needed!! you say you have to pay for sky... so you can stop paying that!